Born to Sierra Leonean parents in Baku, Azerbaijan, Ms. Dumbuya was raised in the West African nation until her immigration to the United States in the early 1990s, just as the decade long civil war ensued in Sierra Leone. A devoted mother of two, Ms. Dumbuya is a natural motivator who has also been priviledged with the gift of a Psalmist in Music Ministry. 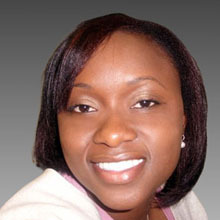 Learning daily about God’s love for all people, Ms. Dumbuya has made it her life’s mission to enlighten and empower underprivileged youths around the world with the tools needed to believe that they have been strategically placed in their respective situations, families, neighborhoods, and nations, for such a time as this (Es. 4:14). Ms. Dumbuya received her primary education in Philadelphia, Pennsylvania, and today holds a BA in International Studies and French from Indiana University of Pennsylvania, and an MA in Organizational Management from Trinity University in Washington, DC.